This volume is a product of the Carrington Lecture Series Project at the SMU Dedman School, in cooperation with the British Institute of International and Comparative Law. Its aim is to explore the nature and implications of the fact that the major security, economic and environmental challenges facing our global society today can be addressed in either of two broad ways: unilateral mechanisms and multilateral mechanisms. This volume, through its 19 comprehensive chapters, draws together a most distinguished group of policymakers and academics to discuss and to debate the interaction in unilateral behaviour in the context of the military, economics, the environment, and international organizations. When the tragedy of September 11 occurred, this volume was already well into the planning stage. 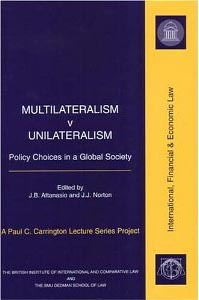 The focus of the volume was changed not so much to be a critique of unilateralism, but a comparison of unilateral versus multilateral behaviour in the above four areas. The issues presented in this volume represent some of the momentous and historic challenges facing our global society as we embark upon the 21st Millennium. As such, this volume should be of interest to all those in the public sector, private sector and the Academy who are concerned with the future of our planet.